On July 22, 2013, the Manchester Township Police Department joined the Project Medicine Drop Program. 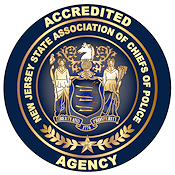 The project is a cooperative effort involving the Manchester Township Police, Ocean County Health Department, Office of the New Jersey State Attorney General, and the Division of New Jersey Consumer Affairs. The project is to assist in preventing the abuse and diversion of unused, unwanted, or expired prescription drugs. The location of the Manchester Police disposal drop box will be in the vestibule of police headquarters. The public will have access to the disposal drop box twenty-four (24) hours a day, seven days a week. The disposal drop box will only accept pills, capsules, patches, or pet medications. The drop box will not accept mail, trash, syringes/needles, or liquids. To learn more about the project call (800) 242-5846 or visit www.njconsumeraffairs.gov/meddrop. The availability of prescription drop boxes is an important part of environmental change that contributes to prevention efforts. 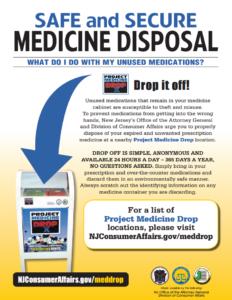 The Ocean County Health Department, local Municipal Alliances, and the Ocean County DART Coalition have consistently promoted the local police departments in Ocean County who currently have prescription drop boxes. · America’s 12 to 17 year olds have made prescription drugs the number one substance of abuse for their age group, and much of that supply is unwittingly coming from the medicine cabinets of their parents, grandparents, and friends.